2014 Winter Wrap-Up Team Listing and Opening! Good morning, Ponyville! Once again, thank you for joining in this year's Winter Wrap-Up. As follows is the initial listing of teams as they have been assembled over the week. Please note that, if you haven't joined in yet, you can still provide your support by offering your help to those in the teams and joining in with their activities! Likewise, the activities are to begin as soon as you wake up on the twenty-second, and end at sundown on the twenty-third of this month, so don't waste a second and head to Town Hall, where you'll be able to pick up your vests and tools! 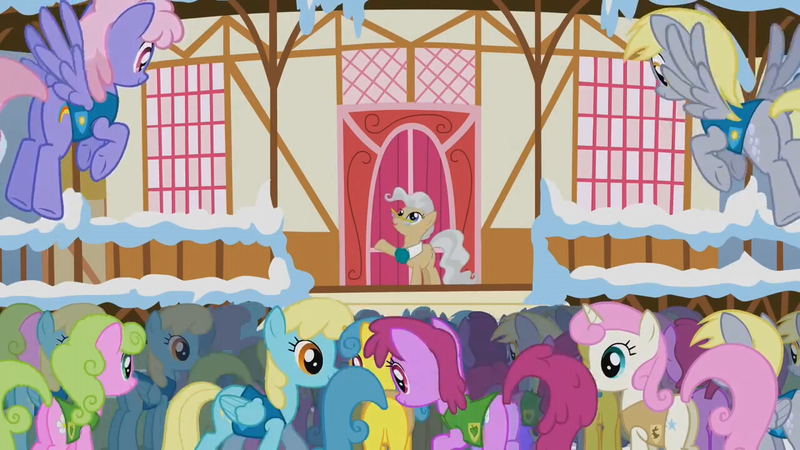 At 12 o'clock, there will be a brief opening ceremony in front of Town Hall, in order to welcome ponies that are late to the party. This team is made up of mostly pegasus ponies, as well as a small number of earth pony and unicorn skaters that will help them melt the lakes that surround the town. The pegasus ponies' duties are moving clouds, letting in sunlight and making sure there's just enough but not too much of it so that the crops and animals can all start spring nicely and in a healthy manner. One of the largest teams, the Animal Team is made up of ponies of all kinds. Their duties are many and shared among its members. They are required to help wake up hibernating animals and feed them if necessary, as well as treat any unexpected colds and fevers they may present. A few pegasus ponies also take on the very important task of leading birds back from the south into their Ponyville home, as soon as the weather is right and comfortable for the critters. Lastly, some of the craftiest and most creative ponies in the team choose to aid with nest-building activities for said birds, so that they have a brand new home to return to and begin their new families. With agriculture as Ponyville's most prolific activity since its birth, a large team with ponies of all kinds is required to help bring the farmlands and general plant life back to a wonderful green. Ponies spread out during Winter Wrap-Up to help plow the snow on crop fields, as well as plant the seeds, depending on their skills and physical strength. They also take care of areas where snow now has been melted by the weather team and make sure new flowers and seeds of all sort are placed all over town to make it even prettier than the year before. This year in particular, they have an additional task to cut down and remove any weeds and thorny vines that may be left over from the Everfree Forest's overgrowing a few months earlier. While not belonging to any specific teams, a few ponies will take care of different duties that relate to supporting the three other teams effectively. Mayor Mare: Opening and Closing Ceremonial Speech-giving. Filthy Rich: Sponsorship of tools and supplies for Winter Wrap-Up. Tea Leaf: Provision of refreshing and relaxating drinks for both ponies and critters. Busara: Provision of meals for volunteering ponies. Did we miss you? Don't worry, please remember that you may join the activities, even if you're not in this list! Volunteer work is always welcome, and it's a wonderful way to support your hometown!